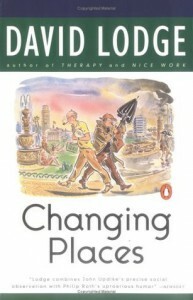 Changing Places: A Tale of Two Campuses, David Lodge, Penguin, 1975, ISBN 0-14-00-4656-9, $5.95, 251pp. I read this on the train to New Jersey and back in January, and I’m sure my fellow passengers were looking at me strangely, because I was snorting and saying, “ha!” outloud. Maybe it’s just being around academics again, but I found this novel extremely funny, and I probably will search out more Lodge based on it. The idea is simple: two professors, one at a small college in England, the other at a huge conglomerate in California, switch places for an academic year. The English professor, who is barely scraping by, longs for the materialism of American society; the American professor, on the verge of divorce, is trying to get his wife to see past his infidelities and acknowledge his worth as a husband. But people are people all over, and while both professors undergo quite a bit of culture shock, and cause some culture shock in the academic societies that they become a part of, the real story here is that it is a small world after all (hmm, funny that, but Small World is the name of the sequel to this novel). One of the best sections of this novel is the depiction of a game called Humiliation, wherein you must name a novel that you have not read, but that you expect everyone else at the table/party to have read. The idea is that by admitting not having read a canonical text (especially among Literature scholars) you will be humiliated. It’s the kind of intellectual party game that Seinfeld watchers just can’t join in on, because it assumes a sophistication. Either that, or it’s just snobbery. 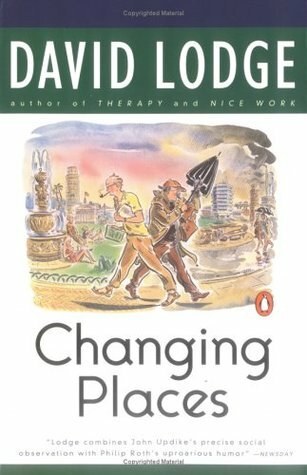 The other thing that raises this story above similar counterparts (including Kingsley Amis’ Lucky Jim, which I liked, but not as much as this novel) is the clever way in which it shifts form within the story. For example, section three is done entirely epistolary, while the ending is written in screenplay format. The novel is also self-reflecting, in a wry sort of metafictional way. You know that you’re reading a story, and the story knows that you are reading it, but instead of pressing the point as in some of the more aggressive post-modern works, it does some sly winks and nods in the general direction of the reader.